While investigating the connections between Kansas City and the Myth of the American West, Jessica Borusky discovered a deep thread running between the Pioneer Trails (beginning in Independence, MO), Missouri Senator Thomas Hart Benton, President Teddy Roosevelt, Missouri painter Thomas Hart Benton, Jackson Pollock, and several pioneer female-to-male cross-dressers. She has designed this project around publicly engaged performances, blending these historical texts into a collaboration between local historians, physical spaces in the Kansas City area, and the Gay and Lesbian Archive of Mid-America. Her goal is to create a project that can bring new audiences together to learn about Kansas City’s rich local and nationally-connected history, while broadening the historical framework for her own performance art practice. Queer-A-Fest Destiny: Pioneers Reimagined will examine five sites in the greater Kansas City area that have been historically relevant for the pioneer trails and for Senator Thomas Hart Benton’s infamous “Manifest Destiny”. At these sites, Jessica will perform a durational work that addresses these historical connections. Events will be created for each site, and each of these will host a different local lecturer, with topics centered around the Myth of the American West and Queer histories. 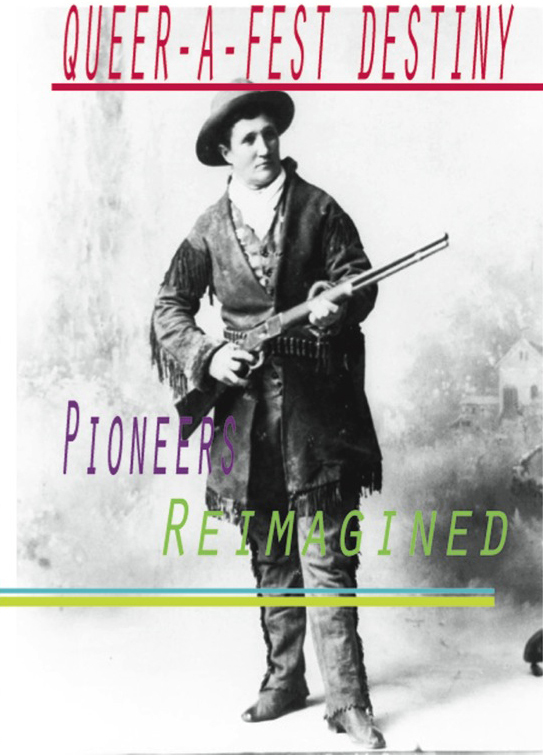 In doing so, the performances will attract the visual arts and gay & lesbian audiences from Kansas City and beyond, as well as those interested in the history of the pioneers. Visually, each location will become host to a traveling platform, which will resemble the traveling wagon shows of the early 20th century, and costume design by local visual artist and designer Maegan Stracy. The combination of bright visuals against the historical backdrops will create a colorful and unique space for new histories to emerge. Proposed locations for this project include the Colonnade at Concourse Park in Northeastern Kansas City, MO; the town of Westport (Kansas City, MO); the Epperson House on the current grounds of the University of Missouri Kansas City, and the town of Atchison, KS. The project locations may expand to other sites as lecturers or performances suit the conceptual needs of the work. These sites may include artist-run spaces and historic grounds within the Kansas City Metro area, including Trail Markers. While the project will be open to various collaborations within the Kansas City community; relationships with The Gay and Lesbian Archives of Mid-America, academic writer and poet Michael L. Johnson, and Assistant Dean of Special Collections at UMKC Stuart Hinds will contribute to a nuanced, inter-disciplinary approach to historical narratives and an informed cross-community conversation about alternative histories. Each event will be documented through video and still photography, and by a collection of objects used in the performances and lectures. All materials will be articulated through a catalogue, which will be permanently housed at GLAMA. There will also be a final reception for the project at the University of Missouri Kansas City in early fall 2015. Jessica Borusky is an artist, educator, and curator in Kansas City. Her artwork deals with unearthing queer histories through performances for video. As a lecturer at University of Missouri Kansas City and Metropolitan Community College, Borusky teaches Digital Foundations, Video Processes, and Art Survey Courses. She is the founder and director of Alt. Lecture KC – a monthly, nomadic lecture series, which pairs a local creative with another lecturer from out of town. For this project, Jessica will be working with Stuart Hinds, director of the Gay and Lesbian Archive of Mid- America and Maegan Stracy, a local fiber artist.